Color Available: Silver, Green, Gold, Copper, Brown etc. With the help of our team of creative professionals, we have emerged as one of the foremost companies of Wooden Composite Panel. Plain Composite Panel gives true beauty to buildings. It is very rigid and strong, despite of its light weight. We are one of the renowned companies that present an extensive series of Composite Panel. These products are obtainable in diverse sizes and designs at nominal prices. - Where the side main members are of steel and centre deck is coasted of RCC. WPC products made from reclaimed wood and recycled plastic. Our Wood Plastic Composites look and feel like natural timber, however they need no maintenance like traditional timbers. Under the guidance of experts, we make use of ultramodern technology and advanced fabrication techniques to provide our clients with safe, environment friendly and world class products. Your present position Products Wood texture ACP Products Roller coating wood texture aluminum composite panel include PVDF coating and PE coating. 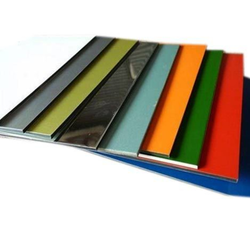 PVDF coating wood texture aluminum composite panel fit for the exterior decoration, while the PE coating wood texture aluminum composite panel fit for the interior decoration. The architectural benefits and applications of Honey comb and composite panels are huge. They make our infrastructure clinically sound and far more efficient. Invicta 63Mk2 also provides the possibility of extending both vertically and horizontally by use of filler boxes. Use either 250mm or 40mm filler boxes (JK202PSH). The Invicta 63Mk2 system, allows flexible on site adaptation of distribution boards.